Retailing is a global industry, so a frequently asked question focuses on how global retail companies compare to each other. Specifically, which retail clothing chain is the world's largest? Many people think that because Walmart is the world's largest retail chain and because it sells clothing and fashion accessories, it must, therefore, be the largest retailer of fashion apparel. But strictly speaking, most retail industry experts wouldn't necessarily define all clothing as "fashion" apparel, and because Walmart stores are classified around the world as either discount department stores or hypermarkets, the chain wouldn't technically be defined an apparel retailer. So Which Retailer Is It? If we take just fashion apparel and fashion apparel retailers into consideration, there isn't just one retail company that's clearly the largest in the world. But the company considered the world's largest retailer of fashion apparel isn't Walmart, and it's also not one the largest U.S. retail companies. It's Inditex. In terms of the total number of global retail outlets, Inditex—headquartered in Arteixo, Galicia, Spain—is the largest fashion apparel retailer in the world. But in terms of annual revenue, Hennes & Mauritz (H&M) beats out Inditex by a few hundred million dollars in the most recent fiscal year for each company. Inditex is such a formidable global fashion retail competitor because the 100 apparel-related companies are not all about retail. 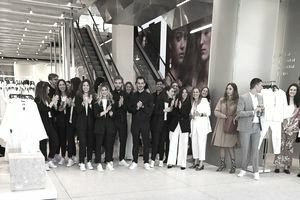 The sum total of the Inditex holdings creates a vertically integrated supply chain, and it's the fast fashion business model that fashion retailers around the world are striving to copy. Fast fashion, once ridiculed and characterized as "disposable fashion," is a major disruption not only for fashion retailing but for the entire global fashion industry. H&M is an apparel retailer that is leading the fast fashion charge around the world. On track to open 400 new stores per year, the major growth markets for H&M are currently China and the U.S. Both the "largest" and the "biggest" fashion apparel retailers in the world have built their global retail empires with the fast fashion business model, so it's safe to say that fashion consumers are happily participating in the global fashion disruption. Fast fashion is a retail strategy that more of the world's largest retailers will have to embrace if they're going to effectively compete with the "largest" and "biggest" fashion retail chains in the world.